DAVIDSON, N.C. — Coming off a 12-point win Saturday at home, the Davidson women’s basketball team closes out a two-game homestand by gearing up for a rematch against the Fordham Rams Wednesday evening in Atlantic 10 play inside John M. Belk Arena at 7 p.m. The Wildcats (14-9, 8-2 A-10) look to keep hold of their second-place standing in the league and seek a season-series sweep of Fordham after defeating the Rams earlier this season. The eight league wins for the ‘Cats are a program best, topping last year’s total of seven. The Rams (17-8, 8-3 A-10) enter the contest having won its past four straight A-10 games and are right behind the ‘Cats in the league standings. Davidson will be having a ‘Gal’entine game on Wednesday, where the first 50 females will receive a FREE Gerber Daisy and the first 250 fans will receive 2 FREE chocolates. In addition, there will be a post-game autograph session with the team where you can collect all 13 Valentines from all your favorite players. •Davidson is in its 40th season and has collected 447 wins in program history. •The ‘Cats are in their fifth year in the Atlantic 10 after a 21-year run in the SoCon. •Davidson was picked 11th in the A-10 preseason poll, while Justine Lyon was all-second team. •10 letterwinners return and three starters from a year ago, while three freshmen were added. •Head coach Gayle Coats Fulks is in her second year (26-27) and has a 1-2 record vs. the Rams. 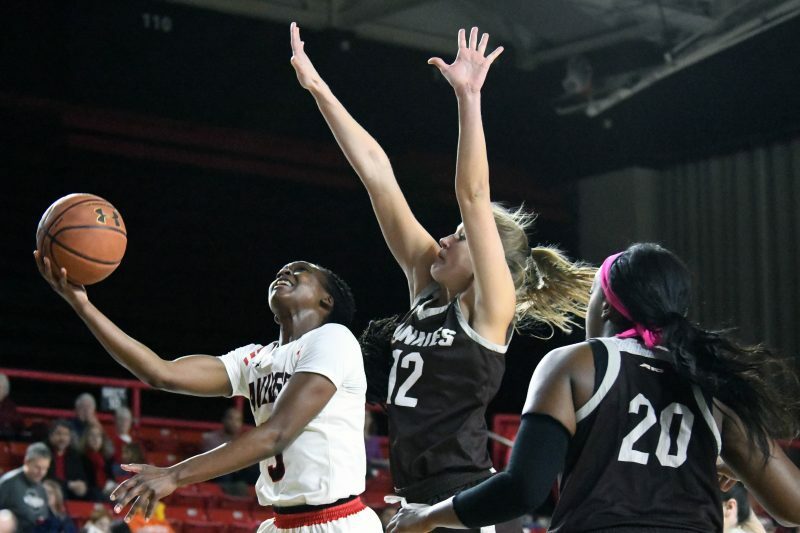 •Katie Turner scored a season-high 22 points and Davidson pulled away late from St. Bonaventure thanks to its free throw shooting in taking a 67-55 Atlantic 10 win last Saturday afternoon. •Thanks to an 11-for-14 shooting performance late in the fourth quarter at the charity stripe, the Wildcats were able to turn a 52-49 lead with five minutes to go into a 65-55 advantage and 25 ticks remaining. All but two of their points came at the free-throw line during a 13-6 game-ending run. •Sarah Donovan recorded her team-leading ninth double-double on 10 points and 12 rebounds, while Justine Lyon dropped in 13 points and Cassidy Gould had 11, eight points alone in the fourth. •Trailing 21-9 in the second quarter, Davidson used a 16-8 to get within 29-25 at halftime. •Sarah Donovan (Jan. 14) and Justine Lyon (Dec. 17) have each been named A-10 Players of the Week, while Cassidy Gould (Dec. 17) has earned Rookie of the Week once. •Davidson ranks among the top-5 in the A-10: points, free throw percentage, 3-pointers made, rebounds & assists, topping the league in three categories (points, free throws and assists). •Katie Turner (8th, 13.3 ppg) and Justine Lyon (10th, 13.1) rank in the top-10 in scoring, while Sarah Donovan is tops in rebounding (8.8) and fourth in field goal percentage (.461). •Turner is tops in assists (4.7, 107) and assist-to-turnover ratio (2.5), while Kianna Speight leads the A-10 in 3-pointers made per game (2.5, 57) and is sixth in percentage (.361). •Justine Lyon became the 20th player in program history to reach 1,000 points last year and currently sits in 8th place all-time with 1,301. The senior also ranks in several other top-15 categories including: field goals/free throws made (10th, 479 / 8th, 266) and three-pointers (13th, 87). •Kianna Speight has 123 career three-pointers for 9th-most all-time, while Katie Turner sits right behind her with 122 career three-pointers. •Davidson’s 14 wins this year are the most since collecting 16 during the 2013-14 campaign. •Four players are averaging in double figures in points, including three who are averaging 13 points or better. •The Wildcats are off to their best start in A-10 play since joining the league in 2014-15. •Sarah Donovan has nine double-doubles this season to give her 12 on her career list. •It is the most double-doubles since Mackenzie Latt recorded 11 as a freshman in 2014-15. •She is averaging 13.6 points, 9.3 rebounds and shooting 52.6 percent in league games. •Donovan has three double-digit rebounding games in the past five games (11.0 per game). •Katie Turner’s 107 assists and Kianna Speights’ 57 threes rank in the top-10 single-season records. •The ‘Cats’ 6-game A-10 winning streak, halted by UMass, was their longest since joining the league. •The Wildcats are 8-2 so far at home, their best start since going 7-1 during the 2012-13 season. •They are outscoring opponents by nearly 13 points (12.7) at home, averaging 73.8 points. •19 of the 23 games has seen Davidson pull in 10 or more offensive rebounds. •Davidson has had at least three double-digit scorers in 20 of the 23 games this year. •Justine Lyon (7) and Katie Turner (8) have combined to lead the team in scoring 15 times. •N.C. State was the highest ranked opponent the ‘Cats had played since No. 7 Georgia (12/9/07). •The ‘Cats’ 90 points at Clemson were the most since a 90-point outing vs. Wofford, Dec. 13, 2009. •The Wildcats and Rams are playing for the 11th time, with Fordham leading 7-3. •Davidson took the first meeting this year with a 60-56 comeback win on the road. •Fordham is coming off a 64-53 win vs. George Mason last Sunday. •Bre Cavanaugh had 22 points in the win and is averaging a team-best 16.4 points per game. •Mary Goulding is second at 11.3 ppg and tops on the team in rebounds (8.0 per game). •The Rams are 5-4 on the road this year, including 4-1 in conference play. •Fordham is allowing 55.9 points per game, second-fewest in the A-10. •10 letterwinners return from last year’s 24-10 team that reached the WNIT Sweet 16. •Head coach Stephanie Gaitley has collected over 600 career wins in her 32 years of coach (161 at Fordham). Davidson next travels to Massachusetts for a rematch game against the Minutewomen this Saturday, Feb. 16, at 2 p.m.